I have always loved the comfort and grace afforded by English country furniture dating from the mid-1600s to the mid-1700s. It was handmade by artisans who understood the importance of proportion, use and the materials they worked in. We live in an age of conservation rather than restoration. Today’s collectors value originality, colour and rarity. There is perfection in the imperfection of these handmade pieces. The combination of the subtle undulations of hand cut and finished timber with countless layers of beeswax causes light to be reflected with a softness and depth. Over time the application of beeswax to furniture changes its colour; polished in soot and dust add to the patina and value of a piece. 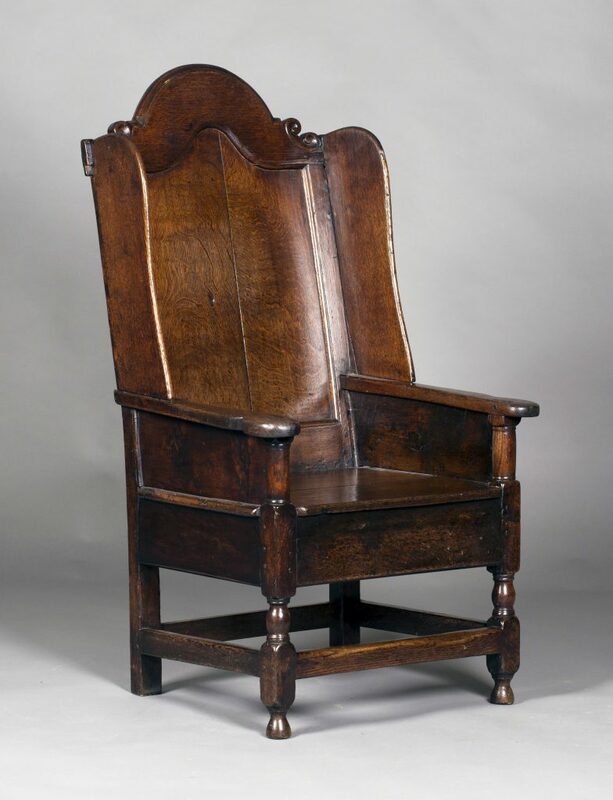 I discovered the oak Wainscot armchair illustrated in a collection of country furniture in Richmond. It dates from the late 17th or early 18th century and its construction is incredibly original. Chairs from this period, particularly armchairs, were symbols of status. Its colour and proportions are superb. The box base and wing back are rare. You more commonly find this type of chair without wings. When they have a drawer to the base they are often referred to as Lambing chairs. 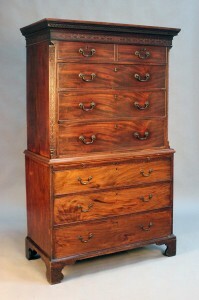 The demand for regional vernacular furniture reaches across the country and this one was sold to a Yorkshire collector. The plating and presentation of food was as important in the 17th and 18th centuries as it is today and was known as ‘dressing’. The piece of furniture where this took place was referred to as the dresser. 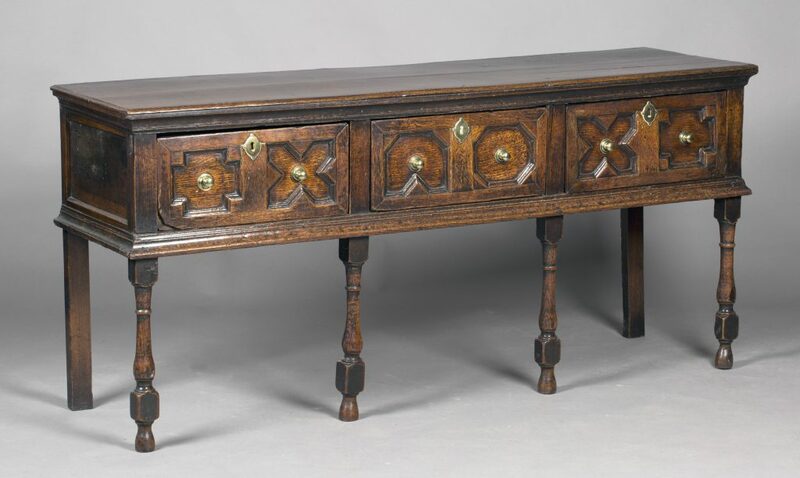 The fine late 17th century oak ‘formal’ dresser seen here with its geometric moulded decoration would have been used in a dining room to put the finishing touches to food as it was arranged on the plates before they were placed on the dining table. 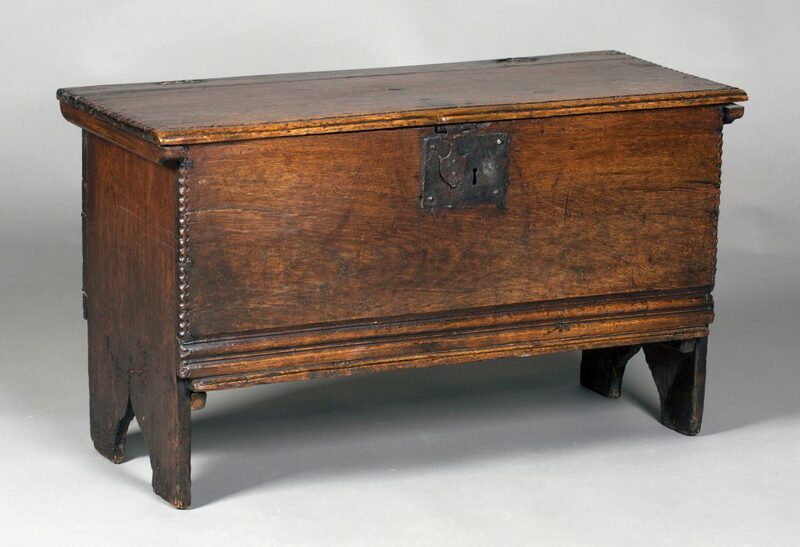 The mid-17th century six plank coffer is small and of fine proportion with a beautiful patina. Where furniture is made by pinning the edges of wooden planks together by means of nails or pegs it is known as boarded or plank construction. The chip carving on the sides, moulded decoration to the apron and original wire hinges are also rare and it is subtle details like these that draw the attention of the connoisseur. This example was bought by a Sussex collector. Prices for fine examples like these remain strong and they realised thousands. Country furniture combines quality with informality and a sense of joie de vivre. More typical 17th and 18th century Wainscot chairs, dressers and coffers, still of lovely quality, can be acquired for hundreds of pounds representing a wonderful opportunity to furnish in the English country house taste. 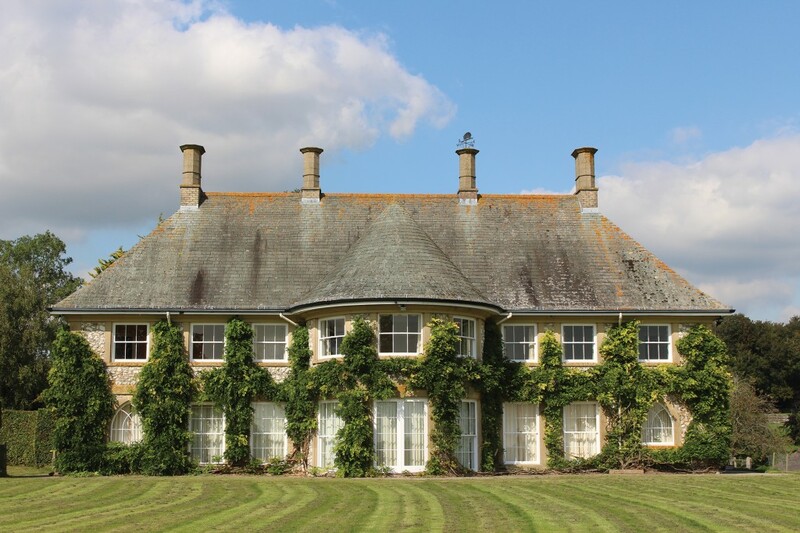 Toovey’s Fine Art Auctioneers are offering the principal contents of Angmering Park House, the home of the Late Baroness Herries of Terregles, as a single-owner collection at their Washington salerooms on Monday 7th December 2015. Baroness Herries of Terregles (1938-2014) was the 14th holder of the barony. She inherited the title from her late father, the 16th Duke of Norfolk and 13th Lord Herries of Terregles, upon his death in 1975. Born Anne Elizabeth Fitzalan-Howard, she was the eldest of four daughters and grew up at Arundel Castle, the Norfolk’s family seat in West Sussex. Lady Anne shared her family’s love of horses from a young age and would become a well-known racehorse trainer and the second wife of Colin Cowdrey, later Lord Cowdrey of Tonbridge, one of England’s most celebrated cricketers. In 1970 she moved to her paternal grandmother’s home, Everingham, in East Yorkshire. There she became Master of the Middleton Hounds. In 1979 she returned to Sussex, making her home at Angmering Park House on the Angmering Park Estate, close to her childhood roots at Arundel. Horse-racing was in Lady Anne’s blood and she set about training racehorses with notable success. Lady Anne’s life was always rooted in the countryside and most especially in the folds of the Sussex Downs. Her home, too, reflected the best of traditional English country house taste. The delightful oil painting by Alfred Bennett (1861-1923) is one of the lots entered from the collection. 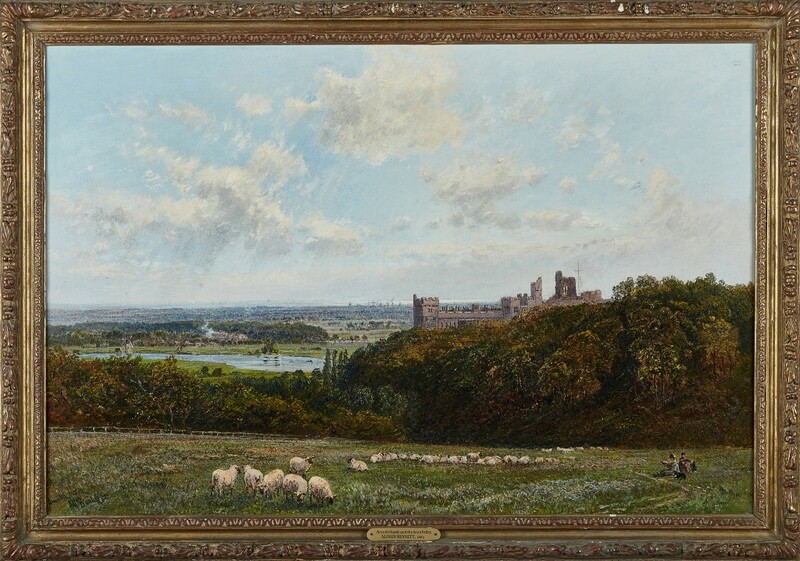 It captures a familiar view of Lady Anne’s childhood home, Arundel Castle, and is expected to realise £800-1200. 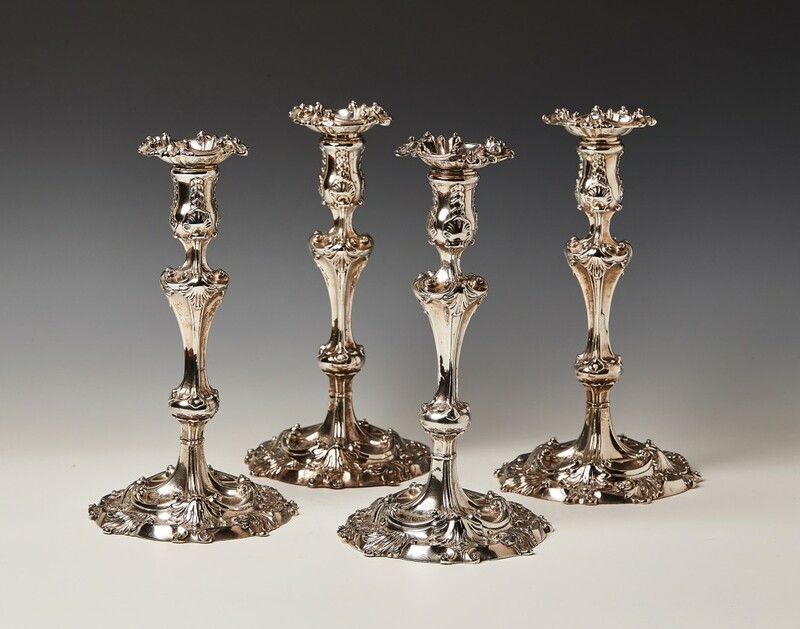 Amongst the silver is a beautiful set of four George II candlesticks by the London maker Alexander Johnston. They date from 1751 and 1752. The Rococo taste is reflected in their decoration with foliate nozzles, shell moulded sconces, waisted baluster stems and leaf scroll bases. They are estimated at £3000-5000. 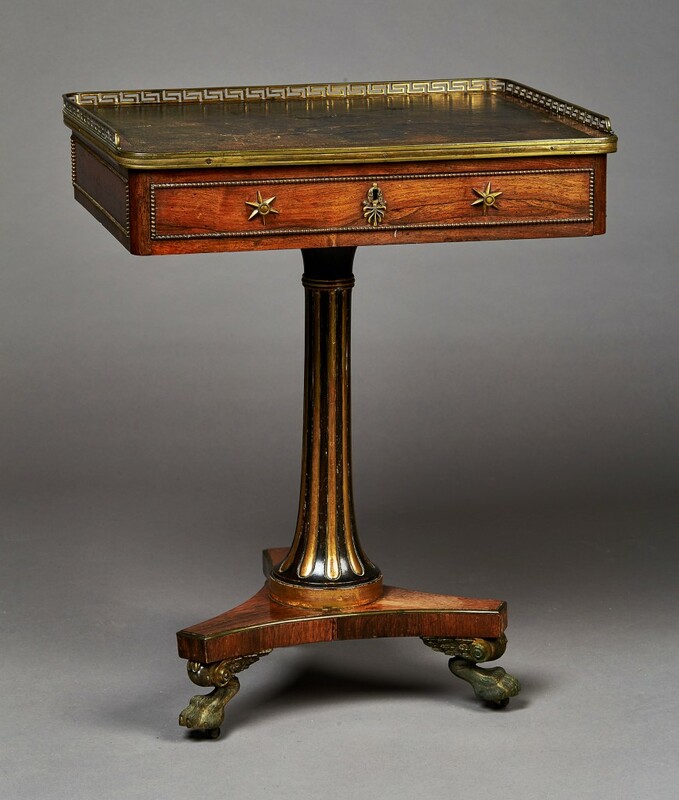 The Regency rosewood and gilt metal mounted writing table has been attributed to the famous cabinet makers Gillows of Lancaster. 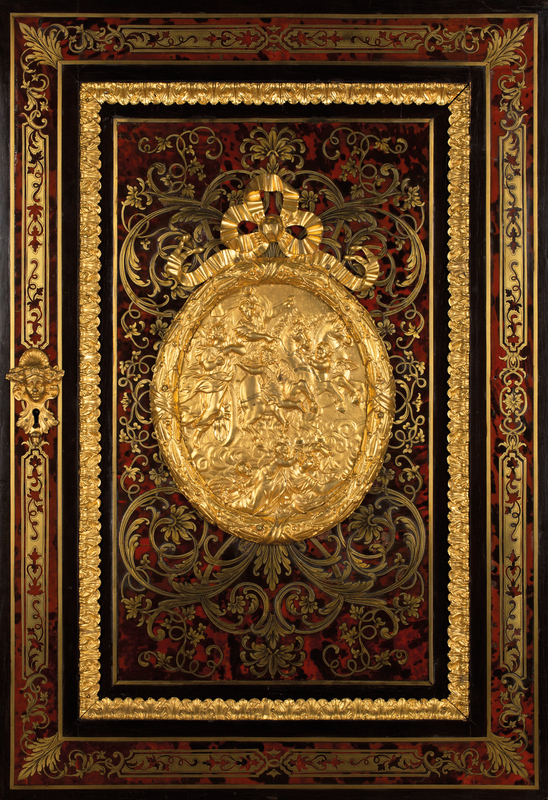 The familiar anthemion key escutcheon and six-point star handles are to be found on other examples of Gillows furniture. 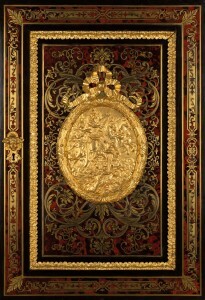 It carries a pre-sale auction estimate of £1500-2500. 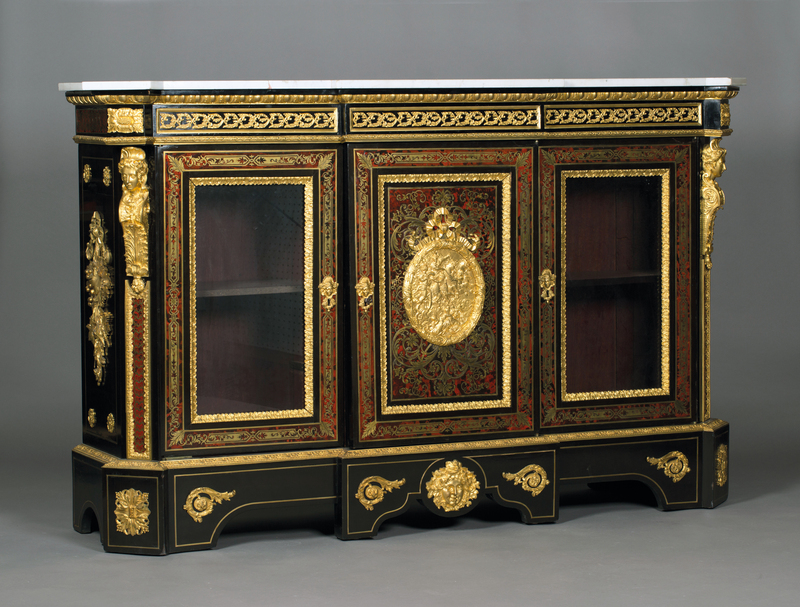 It is one of several pieces of furniture which have been attributed to Gillows of Lancaster in this sale. I have always held a fond admiration for Lady Anne and her family. They have made such a remarkable and generous contribution to our community in Sussex. It has been my privilege to accompany them over many years through their charitable activities and, like so many others, I have valued their friendship and support. 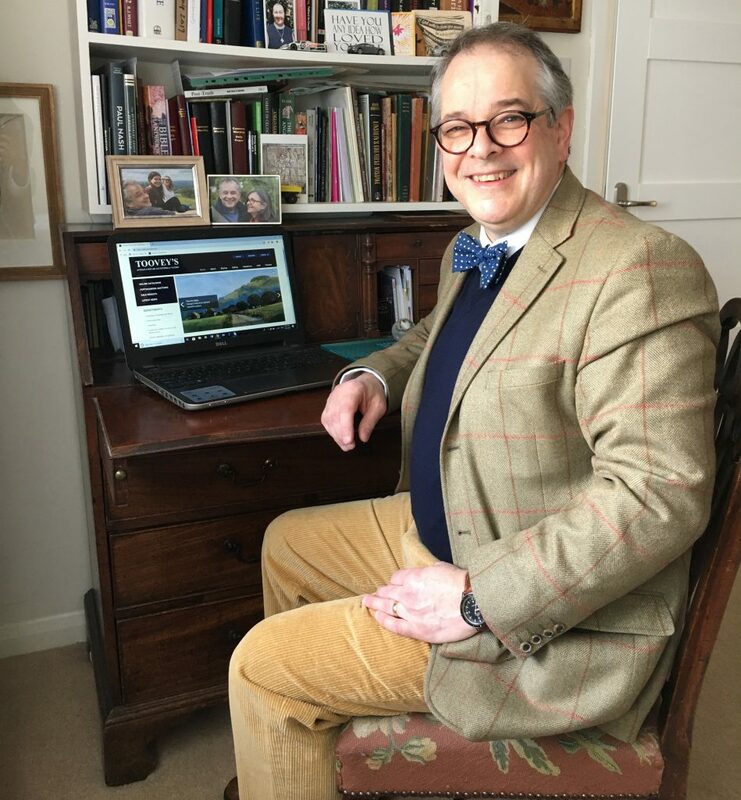 I am, therefore, delighted that Toovey’s are offering the principal contents of Angmering Park House at our salerooms at Spring Gardens, Washington, West Sussex, RH20 3BS. The sale provides an extraordinary insight into the life of a remarkable family. Viewing for the sale of the Collection of the Late Baroness Herries of Terregles, and Toovey’s series of other Christmas auctions, begins this Saturday morning, 28th November 2015. For more details and to preview the auction go to www.tooveys.com or telephone 01903 891955. I look forward to seeing you there! By Revd. Rupert Toovey. Originally published on 25th November 2015 in the West Sussex Gazette. It is remarkable to reflect that between 1968 and 2001 prices for British antique furniture grew pound for pound faster than property in the South East of England during the same period. In 2001 British antique furniture suffered a correction in prices which set a trend of falling values in this market over more than a decade. But in more recent times I have witnessed not only a firming of prices for antique furniture at Toovey’s but the beginnings of growth. 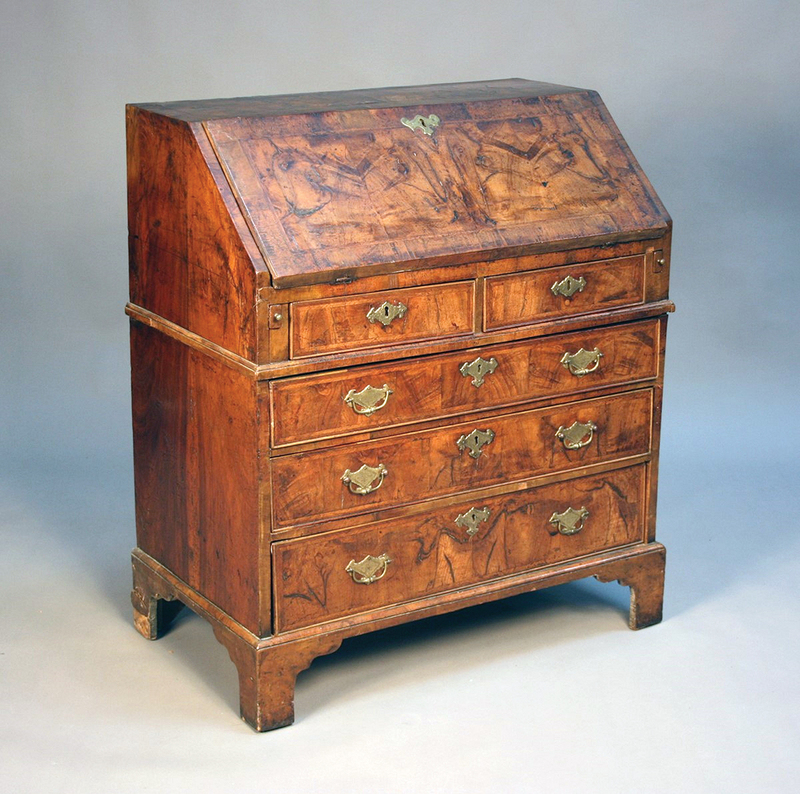 The Antique Collectors’ Club Antique Furniture Annual Price Index for 2014 has just been published. According to this index many sectors of the British antique furniture market have held their position, with what they describe as a ‘stable set of [results for] Walnut, Georgian Mahogany, Regency and even Victorian indices’. 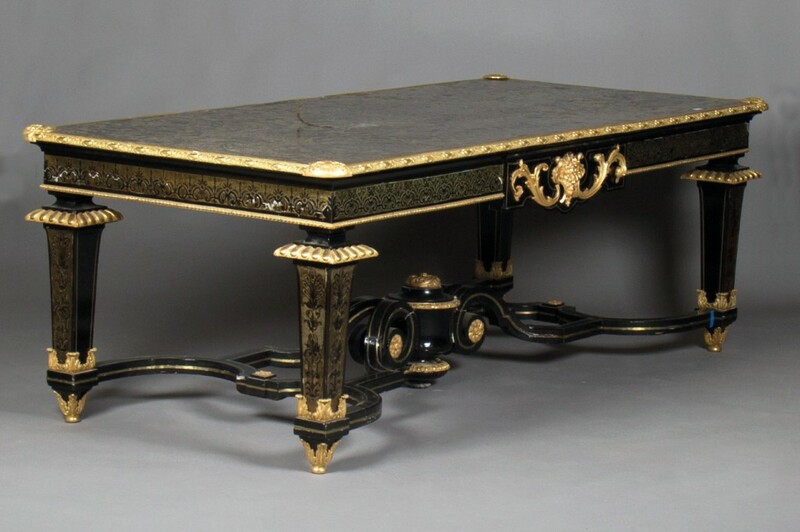 The extraordinary percentage growth over two generations to 2001 was partly due to the exceptional value for money that antique furniture represented in 1968. These relatively low prices did not last for long. Growth was underpinned by strong demand from the United States and a passion for English country house taste amongst domestic UK buyers. The correction in the market began with the tragedy of 9/11 and the terrorist attack on the Twin Towers in New York. After this Americans seemed to reassess their business overseas and their love affair with traditional British art and antiques, largely withdrawing from the market. The comfortable and timeless taste of the English country house fell victim to the success of companies like IKEA, whose famous marketing slogan ‘Chuck out that chintz today’ had begun in 1996. Furniture joined the ranks of the disposable commodity; something which still sits uncomfortably with my sense of the need for good stewardship of the world and its resources. Proper furniture became ‘brown’. The austerity of minimalism had arrived. But fashion and international crises are not the only things which affect markets. Over my thirty years as an antique and fine art auctioneer I have observed that collectors’ markets are driven by our human associations with objects. I regularly hear people in the saleroom remark “Oh my Granny had one of those!” Often the things we most love will have come from, or have associations with, our grandparents or an older generation. After all grandparents are home grown heroes! Our tastes are frequently informed by these sentimental attachments. Objects and art provide the prompts to fond memories and stories, which make up the patch work quilt of our lives. So what is underpinning a recovery of interest in British antique furniture? Overseas buyers have been returning via the internet. And there is growing interest from a large minority of UK buyers. It includes a younger television generation with eclectic tastes which include antiques. They, like me, find it hard to reconcile that a piece of flat-pack furniture can be thrown out and into the landfill to answer fashion. They understand the beauty and quality of an antique mahogany piece of furniture. They are generations whose grandparents have delighted in these pieces. In turn they are delighted that no new trees have been felled to answer their furnishing needs and they comprehend that these pieces will last beyond their grandchildren. These exciting individuals are passionate about history but delight in the new and are not afraid to mix antique and modern pieces. Like the post-war generation many of them are renting their homes. Unable to plan the ‘rosebuds’ over the door in the same way as the generations of home owners before them, they are turning to their interiors to give expression to their individuality and creativity. The uniqueness of antiques provides a vehicle for this expression. 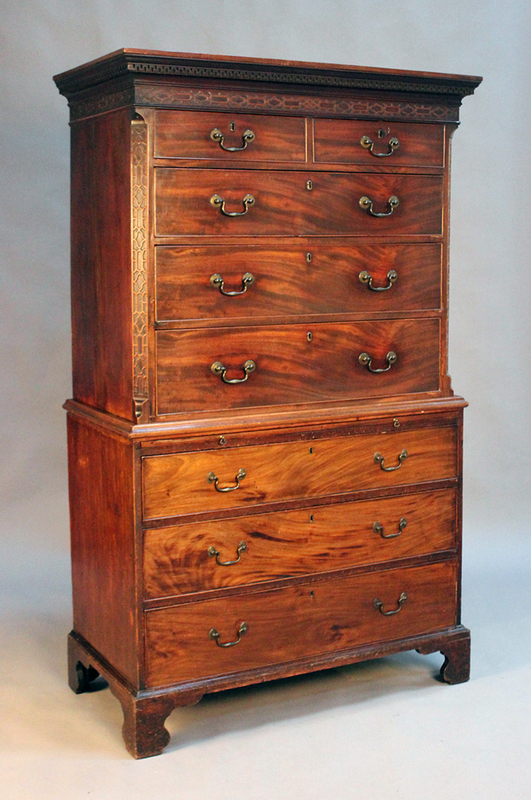 British antique furniture once again represents exceptional value for money. 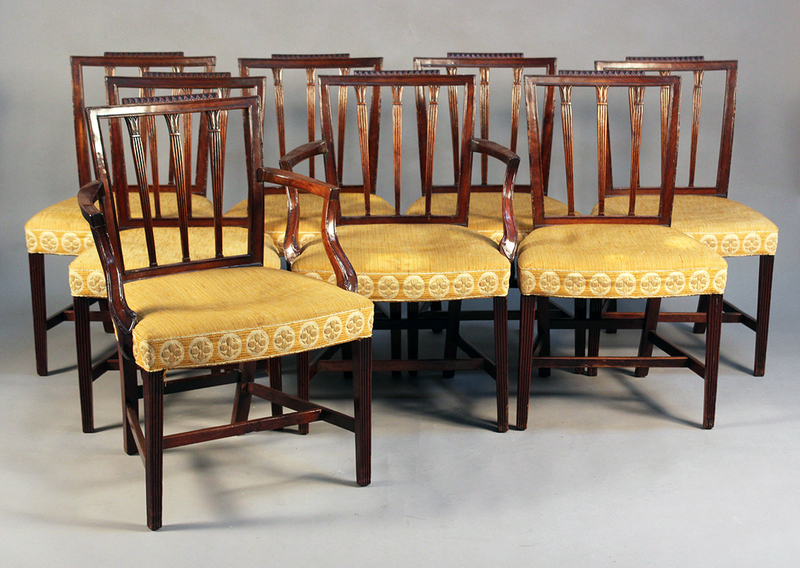 Prices for good quality walnut, Georgian mahogany and Victorian furniture range from hundreds of pounds into the low thousands. Perhaps the market is set for the growth in prices witnessed from the late 1960s to 2001. It would be wonderful if antique furniture could once again prove to be a successful alternative investment. One thing is for sure, if you are investing in British antique furniture it will continue to delight you and successive generations of your family. It offers beauty, practicality and a pragmatic path to better stewardship of the world and its resources. Antique furniture is ‘green’ not ‘brown’. By Revd. Rupert Toovey. Originally published on 18th March 2015 in the West Sussex Gazette.